Prepared using fresh whole milk of the day, our crepes have a unique onctuosity and suppleness. Blended with pure cane sugar and locally ground wheat flour, our crepes are free from any additives, preservatives, flavouring or coloring ! These characteristics are ideal to prepare filled crepes with the delicious toppings of your choice: cocoa powder, sugar, jams of all kind, honey, chestnut cream, or a simple hint of butter melted over low heat to name just a few possibilities. Or let your creativity take over to make mouth-watering crepes cakes ! From mini to maxi size, warm or cold, enjoy our crepes anytime of the day, from breakfast to late night snacks ! Our production flexibility enables us to offer a large range of diameters ranging from mini (15cm) to maxi size (33cm). 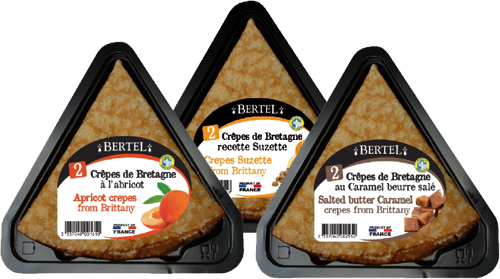 Our crepes can be enjoyed by everyone, anytime, from breakfast to late night snack. 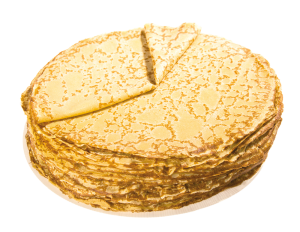 Our crepes are available packed for retail or in bulk for food service. Fresh or frozen. Generously filled with Abricot, Salted butter Caramel, Caramelized Apples, Chocolate/Hazelnuts, Suzette, or Raspberry. These filled crepes are ready to eat desserts on their own. 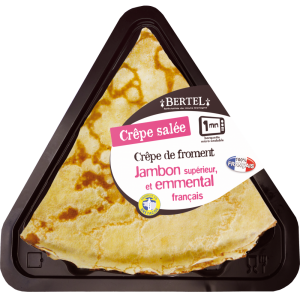 Practical to eat on the run, our filled crepes can also be served gently warmed up or at ambiant temperature with a scoop of ice-cream for example. Snacking format in micro-waveable trays for fresh or frozen retailing. Deep frozen in bulk for food service. 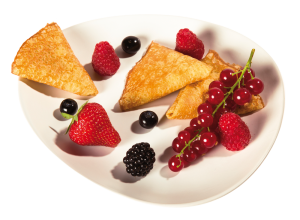 Ideally served alongside coffee or tea, on party buffet, these snack-bite crepes suit all catering usages. Available IQF, they can be defrosted rapidly 1 by 1 to offer great flexibility. Prepared with superior ham, generous shredded Emmental cheese and fresh cream. Our delicous savoury crepe is a ready meal in itself served with fresh letuce and tomato slices for example. Available in snacking format for fresh and frozen retailing, or deep frozen for food service.